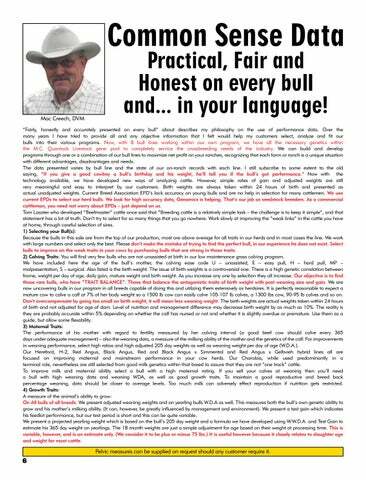 Practical, Fair and Honest on every bull and... in your language! “Fairly, honestly and accurately presented on every bull” about describes my philosophy on the use of performance data. Over the many years I have tried to provide all and any objective information that I felt would help my customers select, analyze and fit our bulls into their various programs. Now, with 8 bull lines working within our own program, we have all the necessary genetics within the M.C. Quantock Livestock gene pool to completely service the crossbreeding needs of the industry. We can build and develop programs through one or a combination of our bull lines to maximize net profit on your ranches, recognizing that each farm or ranch is a unique situation with different advantages, disadvantages and needs. The data presented varies by bull line and the state of our on-ranch records with each line. I still subscribe to some extent to the old saying, “If you give a good cowboy a bull’s birthday and his weight, he’ll tell you if the bull’s got performance.” Now with the technology available, we have developed new ways of analyzing cattle. 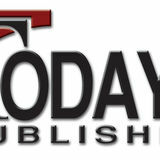 However, simple rates of gain and adjusted weights are still very meaningful and easy to interpret by our customers. Birth weights are always taken within 24 hours of birth and presented as actual unadjusted weights. Current Breed Association EPD’s lack accuracy on young bulls and are no help in selection for many cattlemen. We use current EPDs to select our herd bulls. We look for high accuracy data, Genomics is helping. That’s our job as seedstock breeders. As a commercial cattleman, you need not worry about EPDs – just depend on us. Tom Lasater who developed “Beefmaster” cattle once said that “Breeding cattle is a relatively simple task – the challenge is to keep it simple”, and that statement has a lot of truth. Don’t try to select for so many things that you go nowhere. Work slowly at improving the “weak links” in the cattle you have at home, through careful selection of sires. 1) Selecting your Bull(s): Because the bulls in this sale are from the top of our production, most are above average for all traits in our herds and in most cases the line. We work with large numbers and select only the best. Please don’t make the mistake of trying to find the perfect bull, in our experience he does not exist. Select bulls to improve on the weak traits in your cows by purchasing bulls that are strong in those traits. 2) Calving Traits: You will find very few bulls who are not unassisted at birth in our low maintenance grass calving program. We have included here the age of the bull’s mother, the calving ease code U – unassisted, E – easy pull, H – hard pull, MP – malpresentation, S – surgical. Also listed is the birth weight. The issue of birth weights is a controversial one. There is a high genetic correlation between frame, weight per day of age, daily gain, mature weight and birth weight. As you increase any one by selection they all increase. Our objective is to find those rare bulls, who have “TRAIT BALANCE”. Those that balance the antagonistic traits of birth weight with post weaning size and gain. We are now uncovering bulls in our program in all breeds capable of doing this and utilizing them extensively as herdsires. It is perfectly reasonable to expect a mature cow to calve a calf at 7% of her body weight so a 1500 lb cow can easily calve 105-107 lb calves, a 1300 lbs cow, 90-95 lb calves and so on. Don’t overcompensate by going too small on birth weight, it will mean less weaning weight. The birth weights are actual weights taken within 24 hours of birth and not adjusted for age of dam. Level of nutrition and management difference may decrease birth weight by as much as 10%. The reality is they are probably accurate within 5% depending on whether the calf has nursed or not and whether it is slightly overdue or premature. Use them as a guide, but allow some flexability. 3) Maternal Traits: The performance of his mother with regard to fertility measured by her calving interval (a good beef cow should calve every 365 days under adequate management) – also the weaning data, a measure of the milking ability of the mother and the genetics of the calf. For improvements in weaning performance, select high ratios and high adjusted 205 day weights as well as weaning weight per day of age (W.D.A.). Our Hereford, H-2, Red Angus, Black Angus, Red and Black Angus x Simmental and Red Angus x Gelbvieh hybrid lines all are focused on improving maternal and mainstream performance in your cow herds. Our Charolais, while used predominantly in a terminal role, nevertheless are still selected from good milk genetics within that breed to assure that they are not “one track” cattle. To improve milk and maternal ability select a bull with a high maternal rating. If you sell your calves at weaning then you’ll need a bull with high weaning data and weaning WDA, as well as good growth traits. To maintain a good reproductive and breed back percentage weaning, data should be closer to average levels. Too much milk can adversely effect reproduction if nutrition gets restricted. 4) Growth Traits: A measure of the animal’s ability to grow: On All bulls of all breeds: We present adjusted weaning weights and on yearling bulls W.D.A as well. This measures both the bull’s own genetic ability to grow and his mother’s milking ability. (It can, however, be greatly influenced by management and environment). We present a test gain which indicates his feedlot performance, but our test period is short and this can be quite variable. We present a projected yearling weight which is based on the bull’s 205 day weight and a formula we have developed using W.W.D.A. and Test Gain to estimate his 365 day weight on yearlings. The 18 month weights are just a simple adjustment for age based on their weight at processing time. This is variable, however, and is an estimate only. (We consider it to be plus or minus 75 lbs.) It is useful however because it closely relates to slaughter age and weight for most cattle. Pelvic measures can be supplied on request should any customer require it.